Metal Gear Solid creator Hideo Kojima revealed last week at the VGAs that what we knew as Metal Gear Solid: Rising was no more. Instead, a rebirth of the Rising project was in the works with Bayonetta and Vanquish developer PlatinumGames leading the way. It was a huge announcement that sent ripples through the fandom, for better and for worse. In all honesty, Revengeance could easily be one of the most exciting ninja-action titles to hit the industry like a sack of bricks in a long time. So what's up with the disappointment? To better understand what is going on here, let's take a brief look at the development history of Metal Gear Solid: Rising. Plans for Metal Gear Solid 5 were already being penned in 2008, with Kojima hoping for the staff to take charge of the new title. According to him, the next big hit would feature The Boss and her Cobra Unit during the invasion of Normandy. This does not come to fruition as the staff feels the burden is too heavy too bear. The pitch for a side story based around Raiden is made instead and, bam, off they go. At E3 '09, Hideo Kojima takes the stage at Microsoft's press conference, introduces lead designer Mineshi Kimura, who then reveals the debut trailer of Metal Gear Solid: Rising. It's a slick trailer, featuring Raiden all cyborg-ninja'd up and slicing through a huge robot like a hot knife through butter. The whole design philosophy at this point was to empower players with the ability to cut through anything and everything in the game. 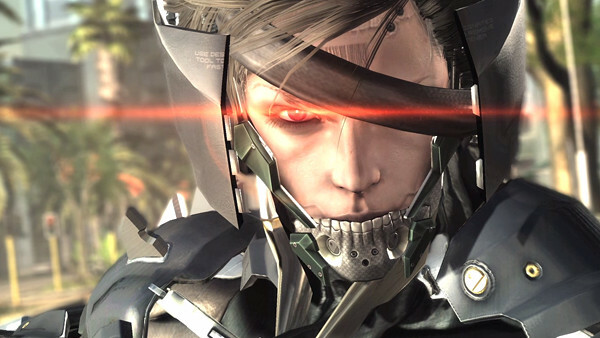 The story is revealed to be set between Sons of Liberty and Guns of the Patriots, laying the foundations for the transformation Raiden takes and is seen in in MGS4. Rather than feature the traditional "Tactical Espionage Action" seen in previous titles, Rising would feature "Lightning Bolt Action," something creative producer Shigenobu Matsuyama described as "hunting stealth," where Raiden would quickly hunt down his enemies while avoiding detection as predators do. As it was, fans were already split with veterans calling foul about including the "Solid" moniker in a side-story featuring Raiden and a more action-oriented stealth gameplay system. Newer fans were a lot more forgiving, although excitement for the game still didn't beat the rage generated from previous numbered titles, and were more along the lines of "Oh, that looks pretty cool." Further bickering ensued with the multi-platform reveal, with many claiming the game was doomed from the get-go, laughing at how Kojima distanced himself from the project as he continued work on Metal Gear Solid: Peace Walker, the "real" MGS5, and the FOX Engine. In a recent video feature released by Konami, Hideo Kojima reveals that with all the design complications the team face, Rising would never see the light of day. This led to its cancellation in late 2010. Kojima reveals that the story, characters and even the cutting system were working just fine, but the project lacked entirely in overall game design. The team faced difficulties when it came to balancing stealth and action elements while level design was technically infuriating combined with the gameplay system of cutting everything. Kojima soberly admitted that "the team was lost in an endless cycle of creating and recreating these elements." So, I iterate yet again, why the disappointment? By the sound of it, Rising was simply spiralling down a dark, nebulous abyss with no end or fix in sight. In the first place, what little was shown of the game could best be described as tech demos. We saw some cool melon cutting action, but that was about it and that can hardly be described as an exciting action game. Enter PlatinumGames, developers of Bayonetta and Vanquish, both action games in a league of their own. The reveal and switch in developers was made just this past weekend at the Spike Video Game Awards. According to Kojima, he had approached the studio earlier this year after much consideration, even to the point of looking at Western studios. Within a week of the agreement, PlatinumGames formulated a work plan of what worked and improvements to be made, complete with project goals and ideas. A few months later and the team had an alpha version of the game up and running with all the elements Kojima Productions was looking for, plus some spit-shine. Kojima himself confirmed that the game will run at a silky smooth 60 frames per second, a requirement that PlatinumGames agreed to when taking on the project. Not only is a game in development hell dragged right out, but it's delivered into the hands of one of the most capable action game developers in the industry "“ and at quite a blistering rate I might add, it hasn't even been a year since PlatinumGames took on the mantle. As much as fans say this isn't a Metal Gear game, here's a news flash for you, it never was to begin with. "Lightning Bolt Action" doesn't describe traditional Metal Gear titles, it's a new beginning and a new venture. Something that was made very apparent when Kojima let his staff take charge of the project. Even so, can anyone really say this is outrageously over-the-top after that fight scene in Guns of the Patriots? You all know which one I'm referring to. If anything, PlatinumGames is the best thing that could have possibly happened to Rising. Their taste for stylistic action is arguably unmatched and a perfect fit for Raiden. As it stands, Metal Gear Rising: Revengeance is easily one of the most exciting ninja-action games announced for next year. Could it spawn an entirely new branch of the Metal Gear franchise? I certainly hope so.